1 Subtle as it was, there appeared to be a message sent from Sean McDermott on Thursday. During the first training camp practice for the Buffalo Bills, both of the team's second-round draft picks lined up with the backups. Wide receiver Zay Jones and offensive tackle Dion Dawkins were with the second unit. So, too, was 2016 second-round draft pick Reggie Ragland, who followed Preston Brown at middle linebacker. 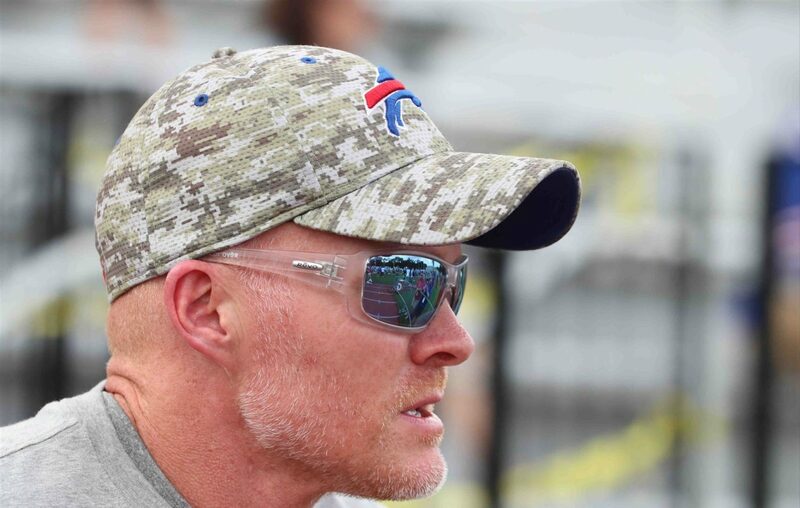 As a first-year head coach, it's not surprising to hear McDermott talk about how every job on the roster has to be earned and not simply given out. He backed up those words with actions, though. There is of course still time for Jones, Dawkins and Ragland to make their way into the starting lineup, but if Thursday was any indication, they won't be placed there based solely on where they were drafted. 2. It was easy to think "here we go again" when offensive tackle Seantrel Henderson left Thursday's practice with a trainer. Injuries and/or suspensions have been a common theme for Henderson during his time with the Bill. In what qualified as a mild surprise, however, Henderson not only returned to practice, he took some first-team reps at left tackle in place of Cordy Glenn. Henderson appeared to be in good physical condition and at an ideal weight as he continues his battle with Crohn's disease. McDermott did say the Bills planned to be careful with Glenn's workload, but it's a good sign for Henderson that he stepped in with the starters. While he still has to serve a five-game suspension, if Henderson can prove his worth to the new coaching staff he might have a spot waiting for him when he returns. 3. It was good to hear Sammy Watkins say he has to earn his contract extension from the Buffalo Bills. While it's hard to imagine Watkins was being entirely truthful when he said he hasn't put any thought into the situation, he was dead on when he said "my job is to go out there and earn it and play and stay healthy. And that's my goal this year." Watkins also said he didn't want to talk about his foot any more -- which was a little bit silly since he didn't speak with reporters at all during the spring, so he had to know the questions were coming -- making it as clear as possible that the injury is behind him. If that's indeed the case, and he accomplishes his goal of staying healthy and producing, he'll be rewarded with a new contract -- either by the Bills or another team.